Our last couple of days in Glacier National Park last summer were spent at Many GlacierLodge in an eastern section of the park that is renowned for wildlife viewings. While in Glacier we had seen many black bears and one grisly, elk, fox, mountain goats, sheep, squirrels and other ground animals, plus bird and duck varieties. Indeed, with 68 animal species and more than 270 bird species, the park provides a wildlife viewing bonanza. Our last day in the park we drove a short distance from Many Glacier Lodge to Swiftcurrent, where there is a motel, campground, and restaurant, our lunch destination. 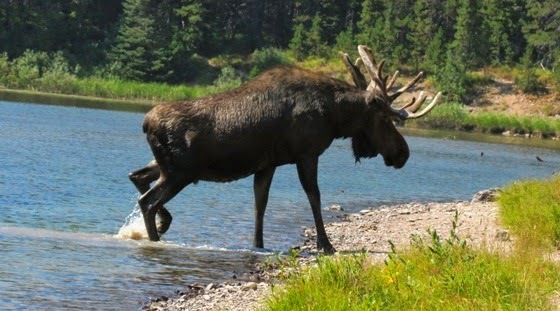 Needing exercise, we decided to walk to nearby Fisherman’s Cap Lake where moose are sometimes spotted. Could we be lucky, too? The answer was a resounding “yes!” Just as we approached the lake from the hiking trail, we could see a large bull moose enter the water on the far side of the lake from where we were standing. 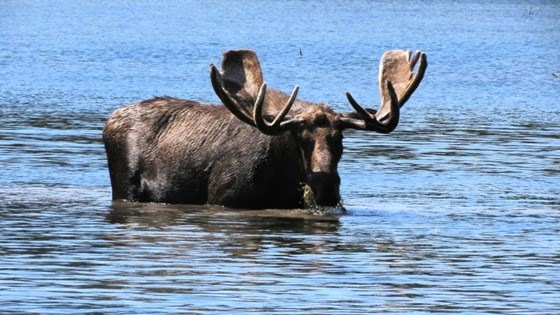 For the next 20 minutes or so, we watched in awe as the moose made his way across the lake, stirring up muddy water with his enormous body. Slowly he plodded along, stopping occasionally to shake away the wetness. Would he come out, we wondered, or become skittish from the dozen or so people on the bank waiting and watching—and clicking cameras. watching him but loped into the forest. 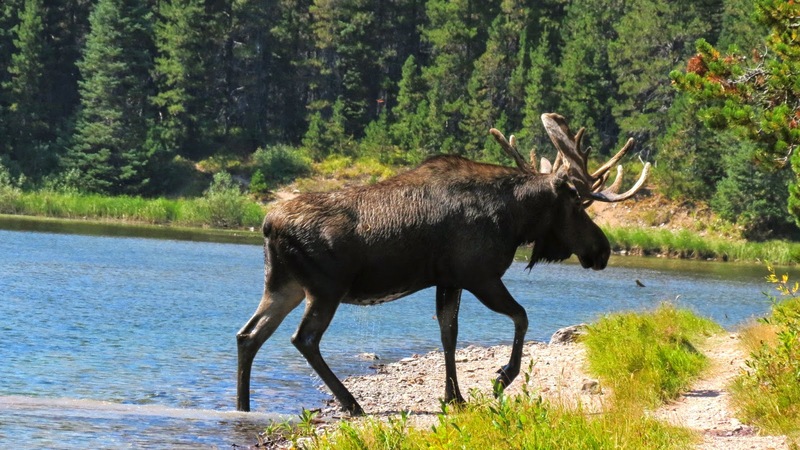 We scarcely dared to breathe—and certainly not to move suddenly—as the moose carefully put one foot on the bank, then very deliberately stepped further onto land. He looked around, sensed that he was not alone, and trotted away into the woods. But we were left to ponder the magical scene that—by happenstance—we were privileged to witness. It was a highlight of our visit to Glacier National Park.